4.16.2 on Unix and Windows systems. 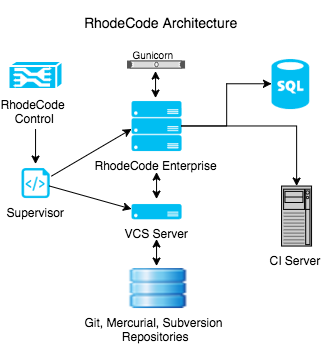 The following diagram shows a typical production architecture. RhodeCode Enterprise performs best on machines with ultra-fast hard disks. Generally disk performance is more important than CPU performance. In a corporate production environment handling 1000s of users and repositories you should deploy on a 12+ core 64GB RAM server. In short, the more RAM the better. For more information, see the Configuration Files Overview section. Currently available in the following languages, see Transifex for the latest details. If you want a new language added, please contact us. To configure your language settings, see the Changing Default Language section. Yes, see Nix Packaging for full details. Internet Explorer 8 support deprecated since version 3.7.0. Internet Explorer 9 support deprecated since version 3.8.0.